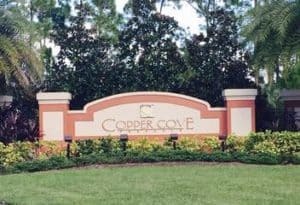 Copper Cove is conveniently located just a couple miles north of Marco Island on the south end of Naples. Conveniently located just minutes from Marco Island and a short distance from downtown Naples, residents of this community have so much to do within such a short proximity of their home. Copper Cove offers a quiet community with many views of lakes as well as the rich natural habitat that surrounds the community.